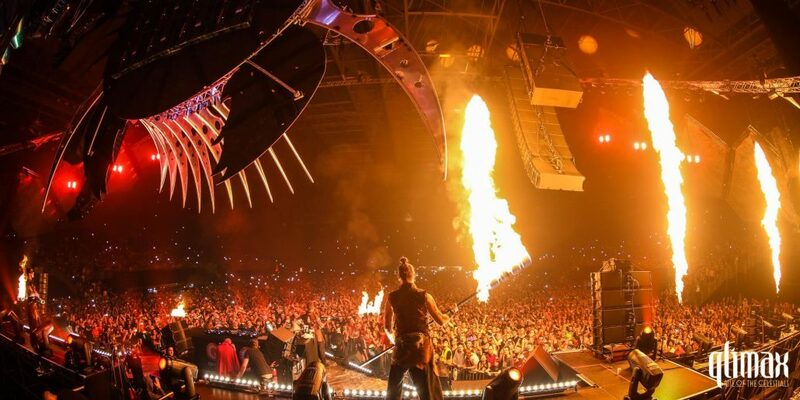 Qlimax, one of the leading indoor hardstyle events of the world, is annually organised in the GelreDome by the Dutch event organizer Q-dance. 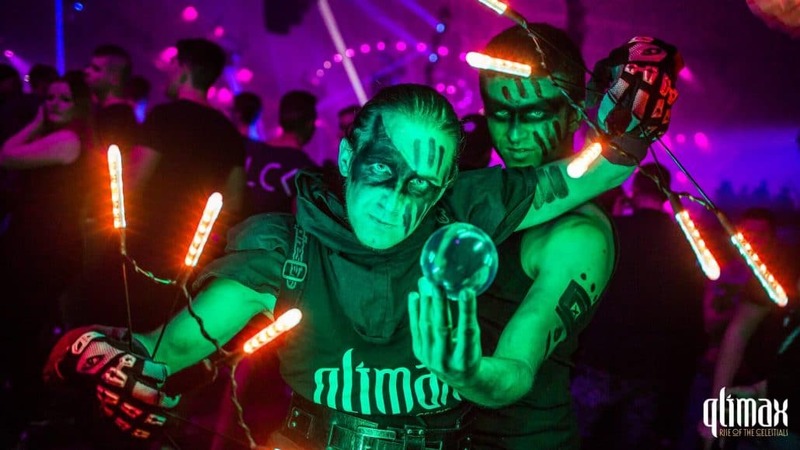 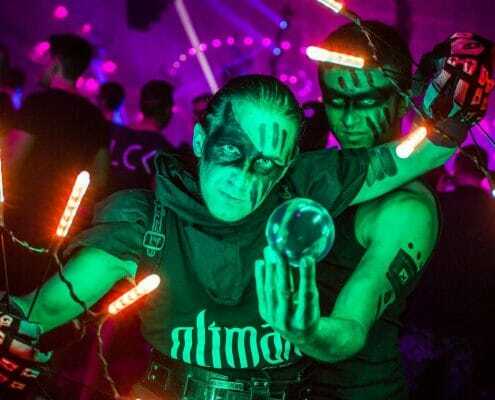 Qlimax is known for its sophisticated production: an extensive range of stage lights, flamethrowers, pyrotechnics and the best artists are programmed into telling a story during multiple stages of the night. 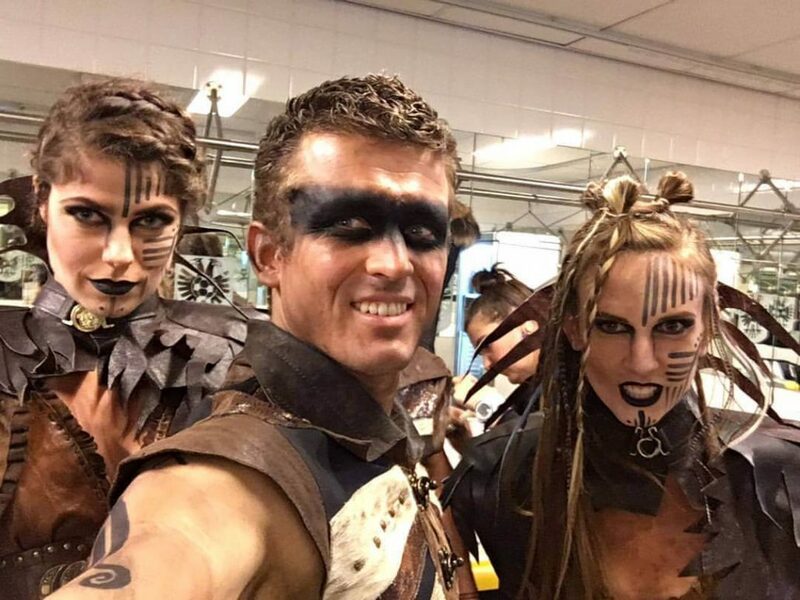 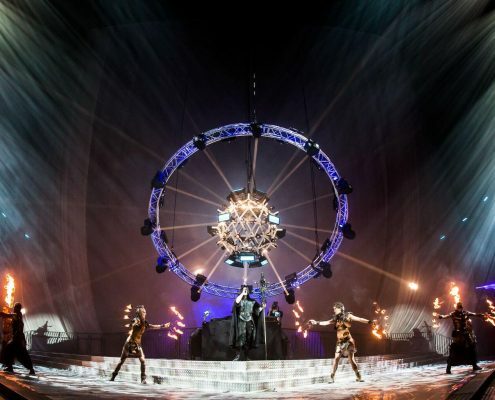 During the night of the event, Lights in Motion performed two shows: the opening show (video 1) and the anthem show (video 2). 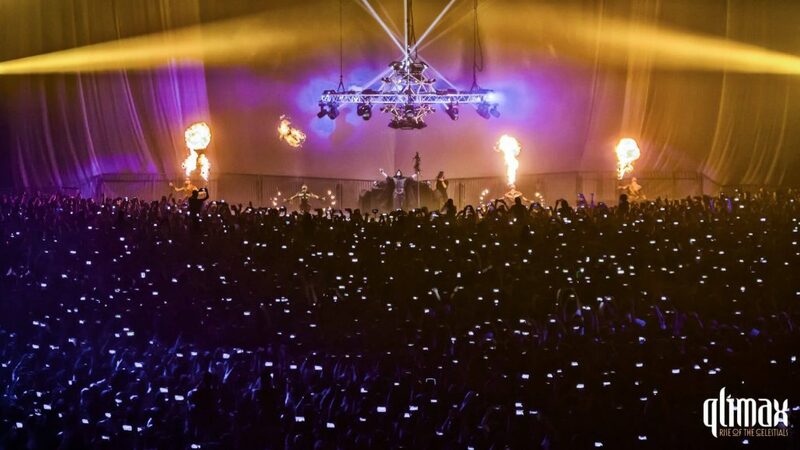 The opening show took place 45 minutes after the doors to the event were opened. 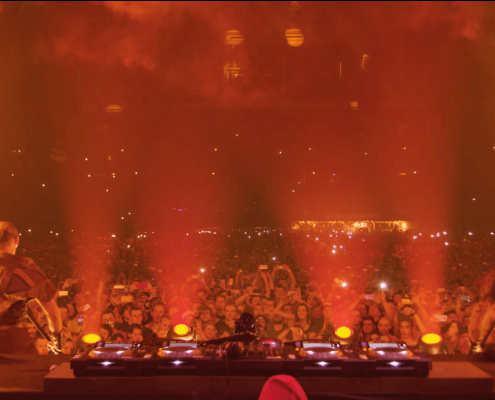 Before the start of the opening show only background music was playing, so together with MC Villain, we had the honour to initiate the event to introduce DJ Tuneboy. 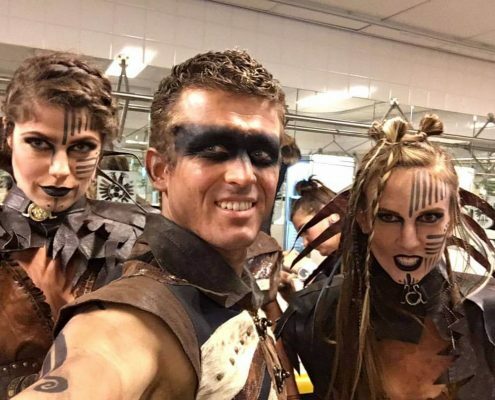 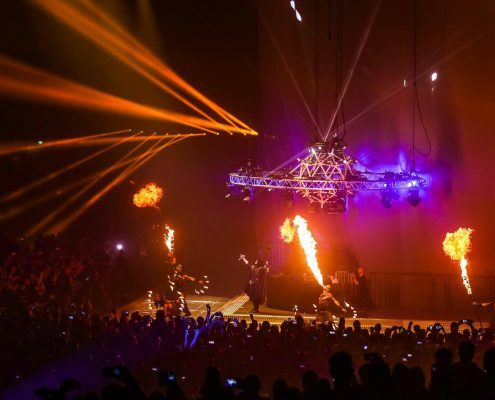 The anthem show took place in the middle of the night, and was the introduction of DJ Coone, who was responsible for making the anthem song of this year: Rise of the Celestials. 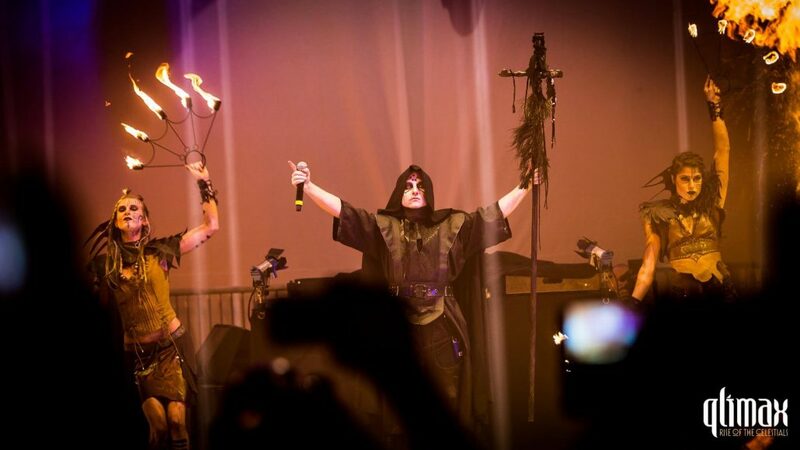 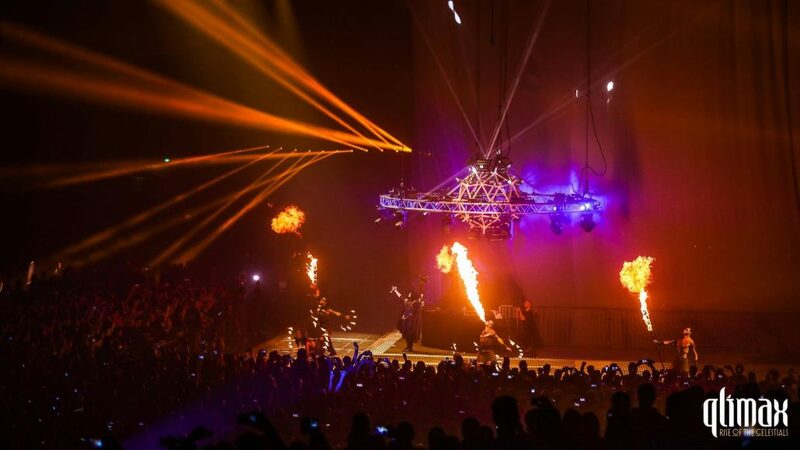 The shows started with our artist Lisa, hoisted up in the air to represent a fire angel, with wings of pyrotechnique. 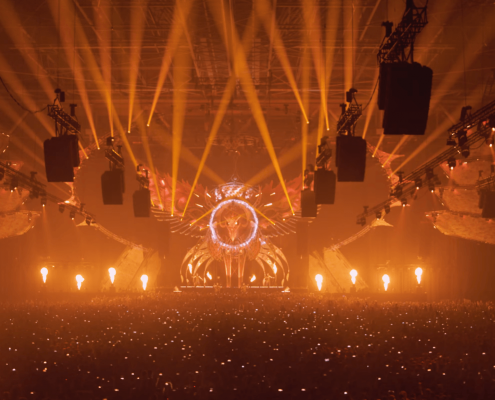 Each edition of Qlimax has a specific theme for the storyline which is frequently related to a spiritual concept. 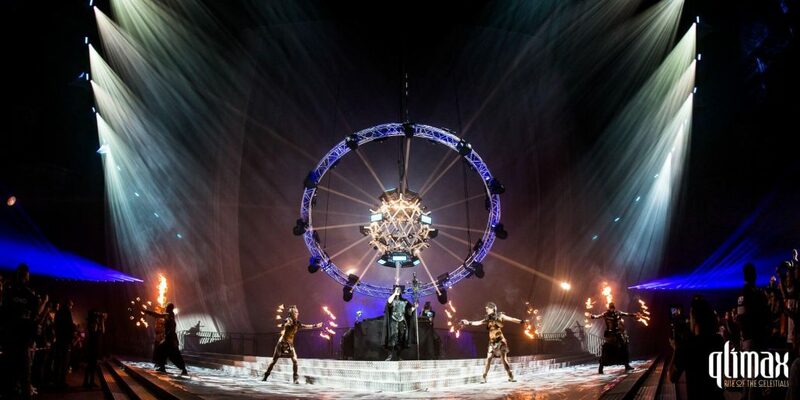 The design of the stage, styling of the DJ’s and the content of the anthem song are customised to this theme. 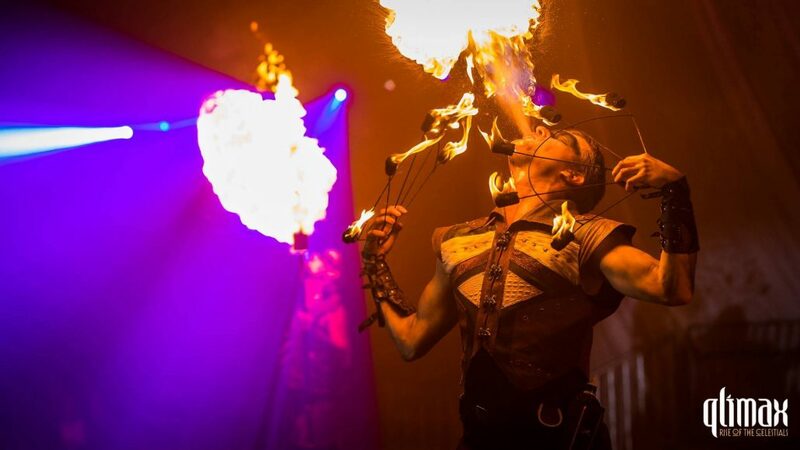 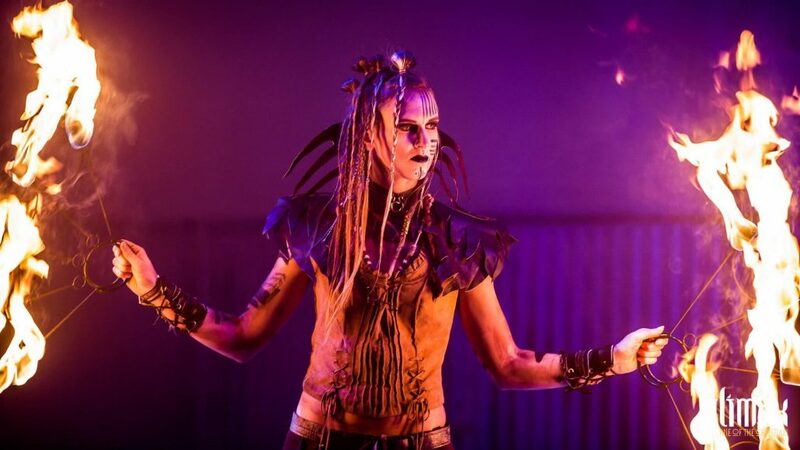 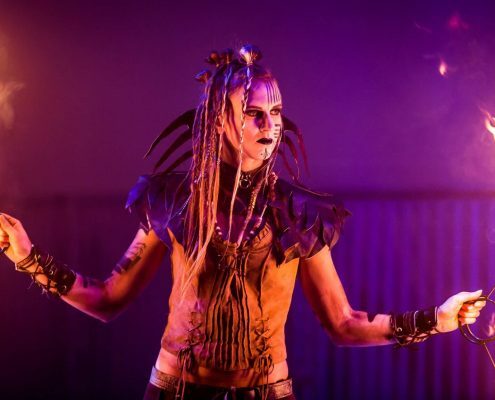 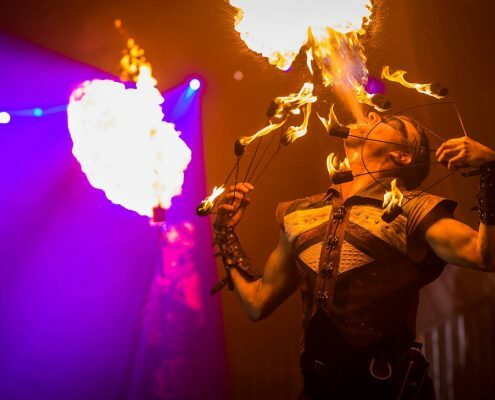 The fire performers of Lights in Motion were asked to embody the live entertainment for this edition, while the stylists of House of Cherries transformed the DJ’s and the Fire Artists with breath taking costumes and make-up to visually express the celestial theme. 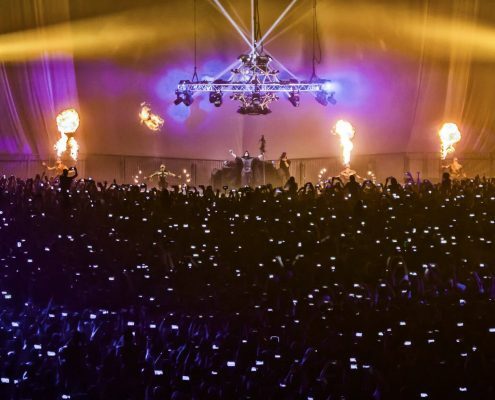 The Saturday night on the 19th of November and a packed GelreDome with an audience of 34.000 people is eagerly waiting for the next stage of the night. 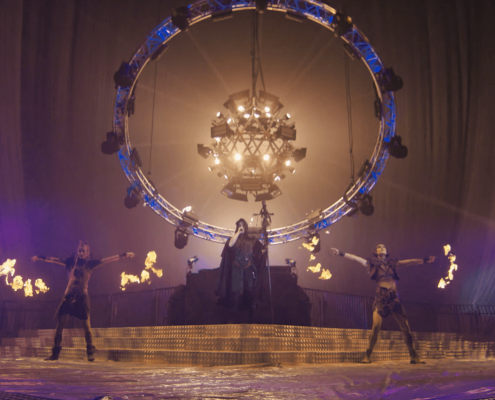 Suddenly a voice resounds through the massive speakers of the stadium: “Transcend the physical… Enter the mystical… Welcome to… Qlimax”. 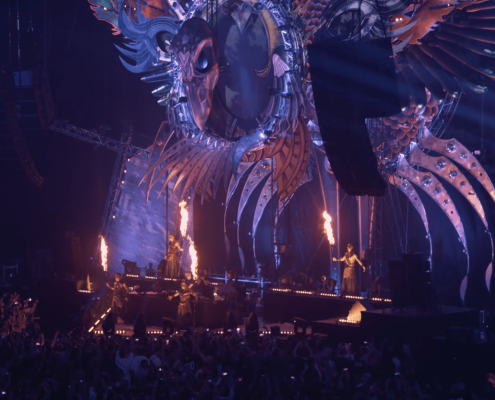 At that moment the enormous white curtain that previously covered the primary stage falls down and unveils a structure that depicts a giant phoenix, the mythical fire bird that symbolises the theme of the night: ‘Rise of the Celestials’. 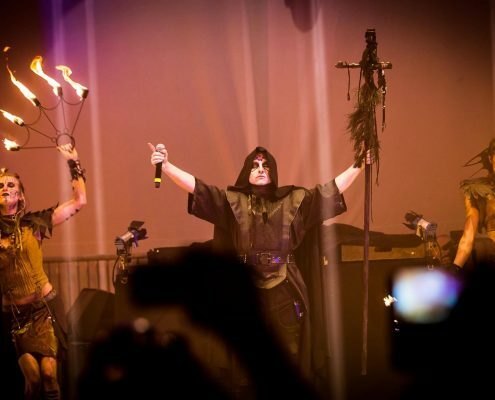 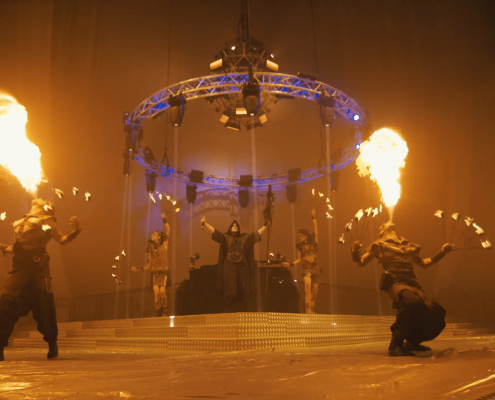 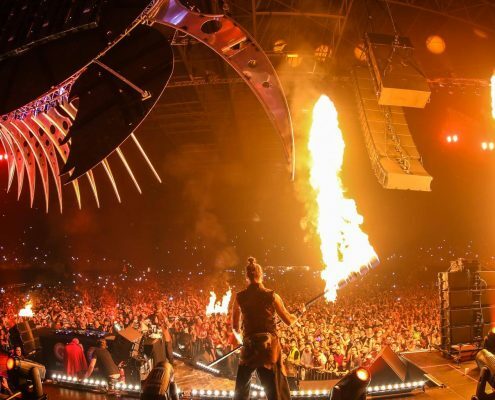 This is the setting in which the fire performers of Lights in Motion played a major role for one night: in the production of the legendary hardstyle event that is known as Qlimax.